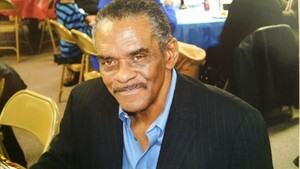 Provide comfort for the family of Larry Harrison with a meaningful gesture of sympathy. Mr. Larry D. Harrison, 64, of Greenville, passed on Saturday, April 13, 2019, at his home. He was the son of the late James and Margie Pinson Harrison, Sr. Surviving: two daughters, Brandy Harrison of Fountain Inn and Tanisha (Tirrell) Freeman of Belton; five sisters, Marie Harris of the home, Ella (Willie) Maull of Virginia Beach, VA, Wanda (Virgil) Franklin of Phoenix City, AL, Karen Cox and Deidre (Halbert) Brockman, both of Greenville; four brothers, James Harrison, Jr. of Tacoma, WA, Lewis Bowens of Greenville, and Ray (Mary) Burns and Charles Bull, both of Taylors; five grandchildren; two great-grandchildren; and a host of other relatives and friends. May God Peace and Blessing be upon you and thank you for your solid conversation. May the family of Larry D. Harrison please accept my sincere condolences hoping you find comfort in God's words at Acts 24:15 and Psalm 37:29.